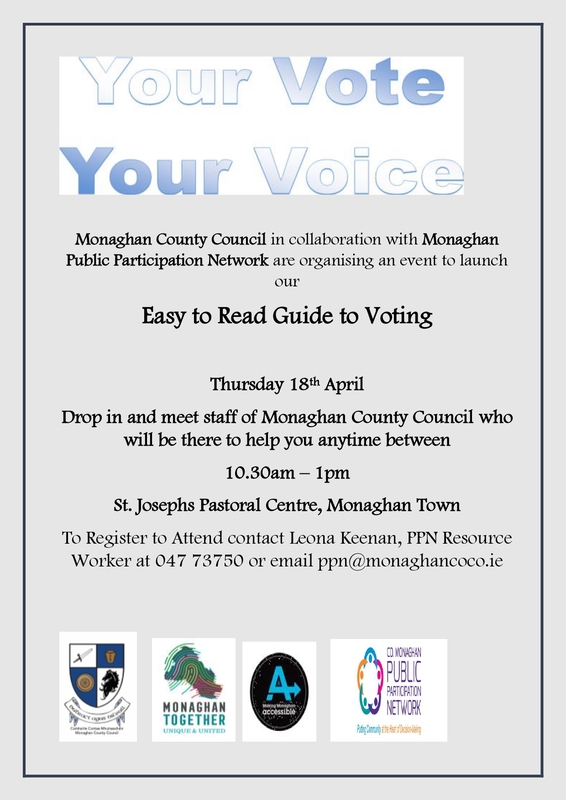 Monaghan County Council and Monaghan Public Participation Network have organised an event to launch our Easy To Read Guide To Voting on Thursday 18th April 2019 in St.Josephs Pastoral Centre, Monaghan Town. Please drop in anytime from 10.30am – 1pm. The guide will provide you with information on What is an Election? Who can vote in Ireland? Are you on the Register of Electors we will show you how to check the register? If you are not registered we can help you with that, What happens on Election Day and What ID to bring with you. Monaghan County Council staff will have sample ballot papers and a ballot box with them.